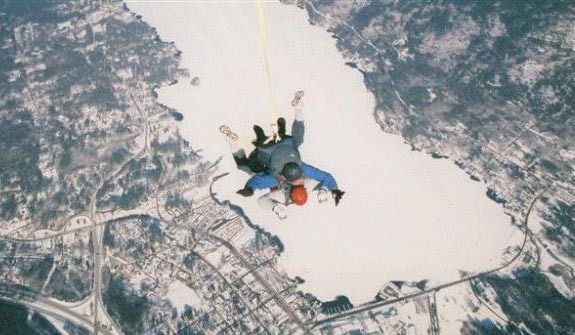 Just because it’s cold doesn’t mean you can’t skydive! Sure, its colder but a pair of gloves, long sleeve shirts, sweat shirt or fleece jacket, you’ll stay warm and have an awesome time. Below are a few common questions that are asked about skydiving in the winter. Yes! You can skydive just about everyday of the year. Except in the most northern states, many dropzones are open year-round. In the colder states they often close in the winter due to the difficulty of keeping the aircraft operation safe. If the runway is frozen or the aircraft wings have a chance of becoming covered in ice, the flight operation is shut down. How cold is it at jump altitude? This really depends on the current weather patterns. As a minimum, it’s 10 degrees colder but it can be 30 or more degrees. In the summer time it can feel like air conditioning. In the winter time and it’s already fairly cold on the ground, you may not even notice the temperature change. In rare cases you can fall through warm troughs of air. In this event it will be cold when leaving the plane, then warm and then cold again as you reach the ground. Of course the first step is to call a drop zone to make a reservation and to make sure they are open. If they are, you’ll want to be sure to wear long pants, warm socks, and long sleeve short, sweat shirt or fleece jacket. The drop zone should provide warm skydiving gloves. One of the biggest challenges with skydiving in the winter is the changing weather patterns. During the summer months in more parts of the country its more likely to find favorable skydiving weather. In the winter, there are more days of low clouds and precipitation. There are still plenty of days when the skydiving will be great in the winter. On the day of your skydive, be sure to call the drop zone to check on the weather before heading to your jump.